As usual, we visited our favorite restaurants and hunted for new culinary finds while we were on the island, but my favorite bite of the week was on our final morning on Maui, when we cut up a sweet, aromatic, shockingly yellow organic pineapple that I’d plucked straight from the fields at Kumu Farms the day before. To peek at some of my Maui eats, check out my Instagram feed and the hashtag I used to organize my island photos, #NomNomMaui. Want to check out the neon yellow pineapple that I picked myself? Check out this pic—and this one, too. If you happen to find yourself on Maui, get yourself over to Maui Tropical Plantation so you can visit Kumu Farms, fly across a zipline, and dine at The Mill House. (Preferably in that order.) The official Grand Opening of the restaurant is July 3, 2015, but Chef Jeff Scheer and his team already have their ducks in a row, and are serving diners now, during The Mill House’s soft launch. By the way, not only is Jeff the Chef (I’m a poet and didn’t even know it!) Maui’s Chef of the Year for 2015, I think he also looks strikingly like Bradley Cooper. And for those of you clucking with disapproval because you spy some beans or corn in my photos from Maui, listen up: when I’m on vacation, I don’t eat 100% Paleo. You can learn more about how I travel while Paleo in Episode 7 of our podcast, but in short, it’s not much of a vacation if I’m freaking out over everything I’m eating. After all, stress management is an important part of health and happiness, too—right? In this episode, Henry and I focus on how to select and cook the perfect steak. This premium cut isn’t an everyday food; steak is an indulgence both because of the expense and the sheer primal joy that we derive from enjoying a seared, juicy cut of properly aged meat. The animal sacrificed its life so we could thrive, so it’s important that we take the care to cook it the right way. Unlike other cheaper cuts of meat (like brisket, short ribs, or oxtail) that are super forgiving with low and slow cooking methods, a premium steak really needs to be cooked properly to be delicious. We discuss the importance of sourcing 100% grass fed beef, where to buy it, and how to cook it—no matter if your method of choice is grilling, pan-searing, oven-roasting, or sous vide cooking. Does the thought of cooking and eating meat make you gag? Then go check out Podcast Episode 4: Viva Las Veggies! My two favorite tomes devoted to meat cookery are The Cook’s Illustrated Meat Book and Bruce Aidells’s The Great Meat Cookbook (affiliate links). J. Kenji Lopez-Alt, who writes The Food Lab column and is the managing culinary director over at Serious Eats, posted three comprehensive steak posts that every serious home cook should read: The Food Lab’s Definitive Guide to Grilled Steak, The Food Lab’s Complete Guide to Pan-Seared Steak, and The Food Lab’s Complete Guide to Sous-Vide Steak. If you’re a visual learner, Bruce Aidells, a.k.a. 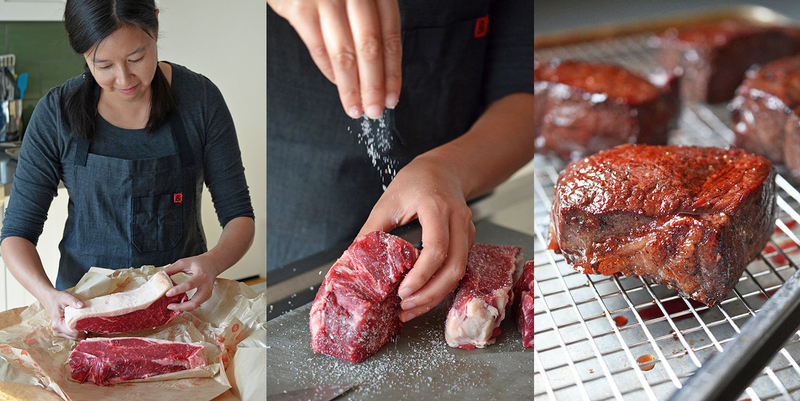 America’s Meat Guru, has an online course on Craftsy that’s all about cooking the perfect steak. By the way, the myth that grass fed steaks doesn’t taste as good as grain-fed steaks has been debunked. Don’t believe me? Check out these blind taste test results from America’s Test Kitchen and The Great Steak Debate. Find a local rancher near you by checking out Eat Wild’s website. In the San Francisco Bay Area, you can buy high quality cuts of meat at Belcampo Meat Co., Brandon Natural Beef, Marin Sun Farms, and Good Eggs. You can also have meat shipped to you from US Wellness Meats (affiliate link), TX Bar Organics, and Tendergrass Farms. My best farmer friend, Diana Rodgers, points out that pound-for pound, grass fed beef is cheaper and far more nutrient dense than a Snickers bar in this enlightening post. The kids talk about how Snuba, a hybrid of scuba and snorkeling, trumps eating shave ice and watching television. By strapping on some Snuba gear and exploring the reef just off the beach near our place on Maui, the four of us were able to get up close and personal with sea turtles, eels, and tons of exotic fish. The boys have already requested another Snuba session on our next visit to the island. In my opinion, the only thing worse than overcooking an expensive piece of meat is to get sick from it. Avoid cross contamination! Use a special cutting board and knife for your raw meat, and don’t use those same tools to cut veggies for a raw salad. I set aside a small ramekin to hold salt and pepper that I use to season my raw meat, ’cause if you just pour salt out of a container, your meat-juice-covered hands will muck up the box and spread the stuff around. Also, don’t place your cooked steak back on the same plate you used to marinated raw meat, and don’t reuse the marinade if you just soaked some uncooked meat in it. If you want to reserve some marinade, do so BEFORE you put raw meat in it. Know where your meat comes from and the likelihood that safe handling practices were used in raising the meat. It goes without saying, but I’m going to say it anyway: after handling raw meat, wash your hands with soap and water, people. Don’t just wipe your grody paws on a kitchen rag like they do on TV. Also, wash all the stuff that touches raw meat with hot, soapy water. Now if I haven’t completely grossed you out: go forth and make a steak!